No list of The Queen's top jewels - of any variety - would be complete without adequate representation of Queen Mary's contributions to the royal jewel vault. 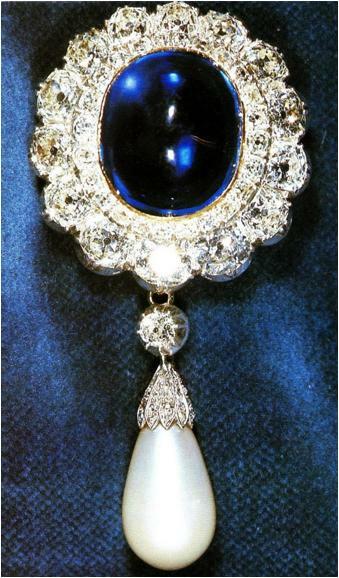 Empress Marie Feodorovna's Sapphire Brooch, an oval cabochon sapphire surrounded by diamonds and finished with a detachable pendant pearl, was among the jewels Queen Mary purchased from the collection of Empress Marie Feodorovna. The jewel has more than a connection to Queen Mary, though. The Empress, who was born Princess Dagmar of Denmark, originally received the brooch as a wedding gift from her sister and brother-in-law, The Prince and Princess of Wales (later King Edward VII and Queen Alexandra, Mary's parents-in-law). There are other sapphire brooches at The Queen's disposal with connections to Queen Mary and the Russian relatives (Queen Mary's Russian Brooch, the Russian Sapphire Cluster Brooch), but the double significance and higher public profile of this brooch launches it onto my list of The Queen's top sapphires.